Getting around Montreal on a budget isn’t all that hard — in fact, many locals and tourists would agree that taking the metro is even more effective and pleasant than trying to navigate the city’s constantly changing detours by car. If you’re planning on staying in the downtown core, Old Montreal and Le Plateau, the STM metro system is easily your best bet. Here’s what you should know about the metro, the buses, and other alternative forms of transportation if you’re planning to visit outside of the city center. It’s very common for city-dwelling Montrealers to choose the metro system over the bus. This is largely due to the city’s constant road construction, which forces buses to change routes often. The metro system is clean, reliable and expansive — it covers all of the downtown core and into some Montreal suburbs like Lasalle, Laval and the South Shore. Fares: Single rides on the metro will run you $3.25 CAD or $6 for two tickets. Day fares are also available and will cost $10. If you’re planning on doing most of your commuting after 6 p.m., opt for the evening pass, which is unlimited until 5 a.m. and only costs $4. Note: Children under 11 ride free. Routes and Hours: The metro starts running at 5:30 a.m. and extends its services through to 12:30 a.m. during weeknights and until 1:30 a.m. on weekends. During rush hour, you can expect to catch a train every 3-5 minutes. The evening service is much less frequent — expect to wait up to 10-15 minutes for a train from 9 p.m. onward. 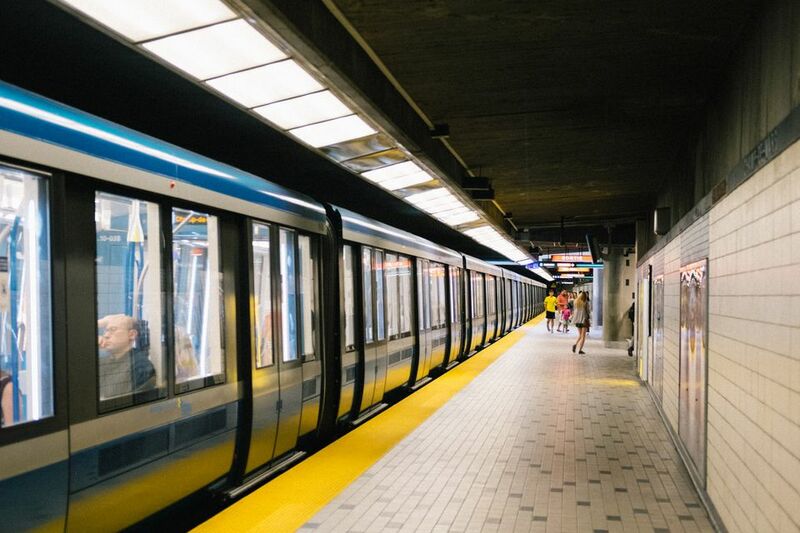 Service Alerts: While Montreal’s metro system is considerably reliable, there are still delays and interruptions periodically — especially during festival season. All service alerts are broadcasted (in French) within the metro cars and stations. You can also check the STM Twitter account for major delays and service interruptions. Transfers: A single fare includes one bus transfer, but re-entry into the metro is not included. If you’re transferring metro lines, you won’t need to pay another fare unless you exit the station. Transfer stations are clearly marked and do not require going above ground. Accessibility: All metro stations have minimal gaps between the platform and the train compared to cities like London or New York, which make it easier to enter and exit the train. Note that not all metro stations are wheelchair accessible, though, many of which opting for stairs over escalators or elevators. A free metro map is available and indicates which stations are accessible. All metro lines have designated wheelchair seating as well as a combination of audio and visual announcements for all stops. Routes: While the metro covers the city center and some of the Montreal suburbs, the STM bus will take you much farther — to the airport, the West Island, and beyond. Local buses run everyday of the week but you can expect significant delays in the winter, especially after it snows (which is often). The night bus schedule is a variation on the daytime route, as such it is very comprehensive and makes it easy for metro riders to get home at night. Hours: Buses run 24 hours a day and become a great resource for when the metro closes at midnight. Expect to wait between 5 to 45 minutes for a bus. It’s also important to note that if you’re traveling alone, you can ask for the driver to let you off between stops to ensure safety. Fares: Fares are the same on the bus as they are for the metro ($3.25 CAD), but unlike the metro, you can only pay with cash or pre-purchased ticket. There is a handful of ways to pay for the STM system, whichever you choose will work for both the metro and the bus interchangeably. Tickets can be purchased at all metro stations and some depanneurs (corner stores) and grocery stores, though it’s less common. Note that metro station kiosks become very busy around the first of the month when locals are reloading their month pass. If you find yourself commuting during this time, try to avoid rush hour when purchasing fares. Fares can also be purchased online but online purchases require a physical STM-appointed USB device that costs $14 CAD and must be shipped to a physical address. Opus Card: Arguably the most popular way to pay, most Montrealers use an Opus card. The rechargeable card costs $6 and can be purchased from the metro station kiosk exclusively. If you’re hoping to buy a week pass or beyond, you must purchase an Opus card. Day/Weekend Pass: The day pass comes pre-loaded onto a paper ticket and costs $10 for 24 hours. If you’re in town for the weekend, opt for the weekend pass, which is just marginally more expensive ($13.75) and grants access from Friday at 4 p.m. to Monday morning at 5 a.m.
Cash: You can pay with cash directly at the metro station kiosk as well as on the bus. There are no change dispensers on STM buses, so try to use the exact amount. Metro station kiosk employees will make change for bills. Credit Card: You can use a credit card when buying tickets at any metro station kiosk. The kiosk allows you to reload your Opus card or buy single ride or day pass tickets. Note that you cannot use a credit card on the bus. While the STM system is the most popular choice for commuting in Montreal, there are plenty of other valid options — from bikes to car-sharing services. 747 Airport Shuttle Bus: An extension of the STM bus service, the 747 shuttle bus will take you directly from the airport to downtown and vice-versa for a $10 fee. The 747 is really easy to use and one of the most economical choices for getting downtown from the airport. Factor in at least 70 minutes to get to the airport during rush hour and make sure to purchase your ticket at an STM kiosk, as these buses do not accept cash. BIXI: Montreal is a biker’s paradise — especially in the summertime. If you’re confident in your cycling skills, consider renting a BIXI. The bike-share company has over 6,000 bikes available across the island with over 500 drop off stations. A BIXI rental will cost you $5.25 for a day pass and is only payable by credit card. car2go: This car-sharing app started in Germany but Montrealers have taken to it fondly. Great for grocery runs or schlepping luggage across town, simply download the car2go app, input your driver’s license and locate a nearby smart car or Mercedes on the map. The cost is about $1/minute and you can expect to pick up and drop off your car on residential streets or designated parking lots. Parking is always free. Exo Train: Montrealers commuting in from suburbs like Mont St-Hilaire or Vaudreuil swear by the Exo train service. If you’re staying in the city center, this won’t be of interest, but if you plan on exploring neighboring towns, this will be your best bet. Taxis and Ride-Sharing Apps: Pressed for time? Taxis and ride-sharing apps (Uber and Teo Taxi) are readily available all across the city and into the suburbs, and are a common form of transportation among locals. If given the option, choose the metro over the bus. The Montreal construction stereotype has a lot of truth behind it — more often than not, buses will have to reroute to avoid construction zones and temporary bus stops are not always clear. The metro is much more reliable and consistent. Night buses are surprisingly efficient. While the metro doesn’t run at night, night buses do an efficient job of stepping in and getting commuters home past midnight. Depending on how far you have to commute, a night bus may be a more economical choice over Uber, which will often have surge pricing when clubs and bars start to close, especially from Thursday to Sunday. Use express buses when you can. If you find yourself commuting into the city from the suburbs, try to hop on an express bus (they’re very clearly marked). This can save you a lot of time compared to a local bus route, especially during rush hour. Do not get into a taxi or Uber on Ste-Catherine Street. Notorious for traffic and hold ups, Ste-Catherine Street should be avoided unless you want to run up your fare while sitting in stand-still traffic. Head one block south to René-Levesque Street before calling a taxi or Uber. Downtown metro stations are very close together, and accessible by the ‘underground city.’ If you get off at the wrong stop downtown, it’s not a big deal. The two main lines are connected and accessible by the underground city (which is really just a big network of office buildings and shopping malls) and you can easily walk from one side of downtown to the other without really needing to hop back on the metro. The metro lines are color coded and ‘Côte Vertu’ is on the orange line. There are four metro lines in total — the green line, the orange line, the yellow line, and the blue line. The train directions are color coded and named after the last stop on the line, rather than Northbound or Southbound, for example. Pay special attention to this, especially if you’re eager to practice your French skills. While ‘Côte Vertu’ may seemingly suggest green line, it’s actually the Southbound orange line (Côte Vertu is a mall in Montreal’s St-Laurent neighbourhood).